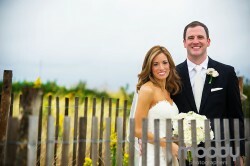 We had a great time with Julie and Jamie on their wedding day. Julie was gorgeous and Jamie quite dapper. We go lucky with the weather and were able to squeeze in some outside beach pictures despite the threat of rain, the timing was perfect for it. Cape May is a beautiful place in the Fall, the beach is awesome because nobody is on it. The ceremony was beautiful on the inclosed patio at the yacht club. A beautiful string band played during cocktail hour upstairs and EBE handled the dance party the rest of the night. You’ll see, everyone enjoyed themselves immensely. The outdoor space of the yacht club had a beautiful fire pit that was perfect for getting a bit of the chill in the night air and warmth of the fire at the same time. It was a beautiful day. Congratulations Julie & Jamie! Julie & Jamie from JoyMoody on Vimeo. Trish & Pro from JoyMoody on Vimeo.